You want to be a better recruiter? You want to quit overcomplicating your recruiting process? Sit back, reflect, simplify. And channel your inner chimpanzee. I had the great pleasure of hearing Dan Pallotta speak recently. Haven’t heard of Dan? Click on his website. His 2013 TED talk has been viewed by 3.4 million folks. Enough said. His expertise lies in innovation, creativity, charity and social change. And if I may be so bold in paraphrasing/interpreting his keynote a bit… all of these items can be addressed by PURPOSE driven practices. Also—shameless plug—I speak about purpose during my HR keynotes, too (Dan, we must talk!). So about that chimp thing. (SPOILER ALERT: I’m about to share a piece from Dan’s keynote. If you plan to see him live, skip this part if you want a bit more wow factor.) Dan gave a super-easy-yet-powerful example of how people can overcomplicate unintentionally. 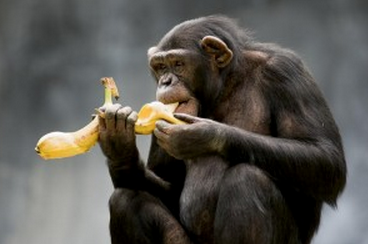 Think about how you, a human being, eat a banana. You grab the “handle” and pull the peel off. But about 50% of the time the handle doesn’t quite grab right. You wiggle the handle back-and-forth creating enough leverage to pull the peel off. However, this creates mushy banana. Not only does it waste banana, but also it is messy. What do chimps do? They open the banana from the little nub at the opposite end, the no-handle side, and peel easily. Who knew the little nub pops right off?! I tried it myself. No wiggling, no finding leverage, and most importantly, no messy/mushy banana. That solution NEVER once crossed my mind in 43 years. Likely didn’t cross your mind, either. What Dan suggested is as we innovate new processes, we to relax. Remember the purpose of what you are trying to accomplish and some obvious (and not-so-obvious) ideas come. Quit overcomplicating. I’m a VP and a recruiter. I tend to overcomplicate things. I just do. It stinks. But I’ve trained myself to be cognizant of it. Here are some basic ideas I have learned to keep from overcomplicating a recruiting process. Always go back to purpose. What is your purpose as a recruiter, what is the purpose of your company, what is the purpose of the process? And that does include weighing the altruistic purpose of it all. Get a tech-solution. OK let’s be honest: Implementing a tech solution can be a crappy, complicated mess. But once implemented, it will save you time and money. I have wasted countless payroll hours trying to create “work-arounds” to things technology will fix in a second. And there are some really affordable products to help. Check out Steve Boese’s HR Technology blog for all HR Tech ideas! You only need to worry about 3 categories of questions: Can you do the job? Will you love the job? Can we tolerate working with you? Piggy-backing on #2: weird brain-teaser questions have been proven ineffective. If you want to be entertained, feel free to use them. If you want to see if a candidate can do the job, not so much. Let the candidate tell their story. Shut up and listen to their ideas of purposeful work. We overcomplicate by talking too much. Video interviewing is a great way to do this. Also, your purpose in interviewing can’t primarily be to avoid getting sued. Don’t get more than 5 team members’ feedback on the candidate. You already have a resume or video interview, you already have “knock-out” questions in your ATS application, you already have some opinion from HR on your prescreen. Do you really need to have a lunch with six of your reports, a peer interview with five folks, a homework presentation that three others watch, and feedback from the CEO? All of the “steps” may be important, but scale back on the number of cumulative attendees. Let your hiring managers do the heavy lifting. They aren’t idiots. They own the decision. And this isn’t a play to get out of work… this is a play to empower others and let them experiment finding their purposeful interviewing outcome. Also, it is more sellable and efficient. I’m going to stop there before I further complicate things. Check out Dan. Chill out. Find your purpose. Happy recruiting.